Aquatherm’s heat fusion delivered long-lasting pipe connections without an open flame. "Aquatherm was a good alternative. We didn’t want to risk having any leaks at all, and we knew we’d get a weld that would keep the product together without any failures– forever." Upgrading data centers to a chilled water cooling system while keeping them operational. Situated in Rexburg, ID, the Brigham Young University-Idaho campus is home to roughly 12,000 students and includes about 40 buildings on 400 acres. The university’s administrators had long sought to upgrade its data centers from traditional UPS and single module/non-scalable air conditioning products. In winter 2008, they decided to significantly upgrade the school’s IT infrastructure. However, they also needed to upgrade the cooling centers at its two data centers. Salt Lake City-based Advanced Power & Cooling was brought in to provide the university with a total solution. “BYU-I was experiencing hot spots and also was very concerned about ‘high density’ racks/equipment and their inability to handle this concern,” said Howard Wageman, with Advanced Power & Cooling. The University decided that a “band aid” solution of moving a few racks around, installing some perforated floor tiles, and adding a return plenum on the top of the CRAC didn’t allow much room for future growth and quickly dismissed the idea. Wageman and staff introduced the APC by Schneider Electric in-row product line as a more comprehensive solution. After several on-site visits and a trip to the Schneider Electric Technical Center (SETC) in O’Fallon, MO, BYU-I staffers were convinced the APC InRow RC product was perfect for handling and displacing these high kilowatt loads. The campus data center, which staffers refer to as the computing center, is split between two buildings, the two-story Kimball Administration Building, built in 1999, and the four-story Smith Building, which houses classrooms and was built in 1967. Kimball’s data center measured 918 sq ft and Smith’s center was actually an 804 sq ft telephone relay room in the basement. The design and construction staff decided to remove some walls and expand the centers—Kimball by 407 sq ft and Smith by 415 sq ft. While the project was spread across two buildings, each with a separate mechanical system, it was treated as a single project and tackled simultaneously. 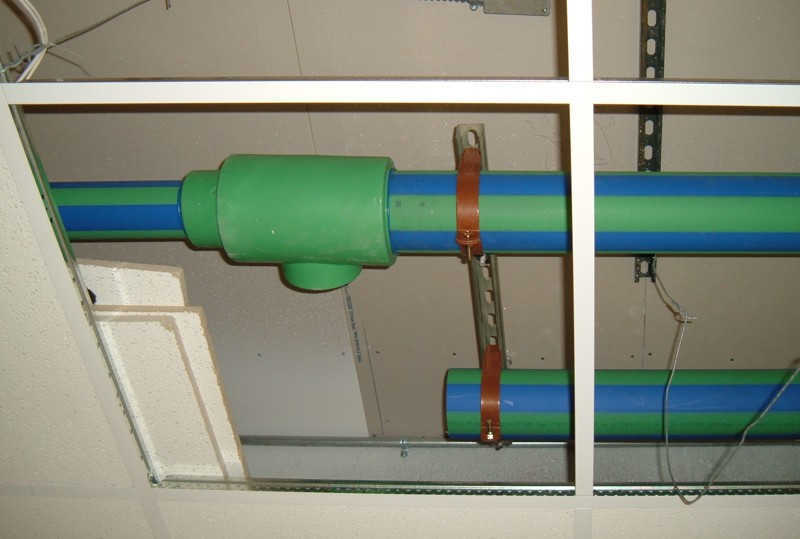 In March 2008, BYU-I design and construction staff also began considering its piping options. BYU-I needed to bring chilled water into the data centers from newly constructed mechanical equipment enclosures—including new ArctiChill chillers—adjacent to each building. While welded steel pipe was fine for the exterior portions of the system, welding inside the data centers wasn’t an option, as they didn’t want to risk setting off the fire alarms and sprinkler system. Colvin Engineering Associates, Inc., the project’s mechanical engineer, presented Aquatherm Blue Pipe to BYU-I. Aquatherm, a German-based pipe manufacturer, produces fusible polypropylene pipe specifically for heating and cooling applications. While only recently available in North America Blue Pipe and its sister-system Aquatherm Green Pipe (for potable water applications) have enjoyed decades of success in over 70 countries around the world. Avoiding welding and the risk of flames, combined with the system’s durable heat fusion connections made sense for the project, said Jon Burrows, LEED AP, project manager with Colvin. “Welded steel was too messy for installation near the server equipment while it was operating,” Burrows said, adding, that grooved steel fittings had a greater potential for leaking. “Aquatherm was a good alternative. We didn’t want to risk having any leaks at all, and we knew we’d get a weld that would keep the product together without any failures – forever,” added Jedd Walker, BYU-I campus architect. Construction began in July, and the project took about two and a half months. Marlin Hill, president of Mountain West, which served as the mechanical contractor on the project, said the project was made easier by the lighter weight of the polypropylene piping. He added that since his installers were already versed in heat fusion welding, the connections were performed with relative ease. However, he did note, that the fusion connection process definitely requires the installer to think ahead in his installation. For instance, university safety staff insisted that Mountain West fill out paperwork each day for a hot work permit, or fire watch, indicating that they were using the welding device. This resulted in some additional daily paperwork, but nothing more. The engineering firm recommended insulating the pipe, so Aquatherm Advanced, a proprietary integrated insulation wrap was added to the four-inch Blue Pipe piping. Since the pipe has a natural insulation value of approximately R-2 and Aquatherm Advanced has a value of roughly R-4.2, the pipe ended up with an insulation of roughly R-6.2 and still had smaller outside diameters than other piping alternatives with similar insulation values. The computing center is now up and running. The hot and cold aisle concept with the in-row cooling units is very efficient in cooling the equipment, and some of the in-row units actually have to be shut down in order to comfortably work in the space. BYU-I Design and Construction is pleased with the way the project turned out, and is considering using Aquatherm on other applications on campus. “This isn’t a spectacular project, in terms of the data center not being some large powerful center, but it’s what helps keep this university running,” concluded Walker.